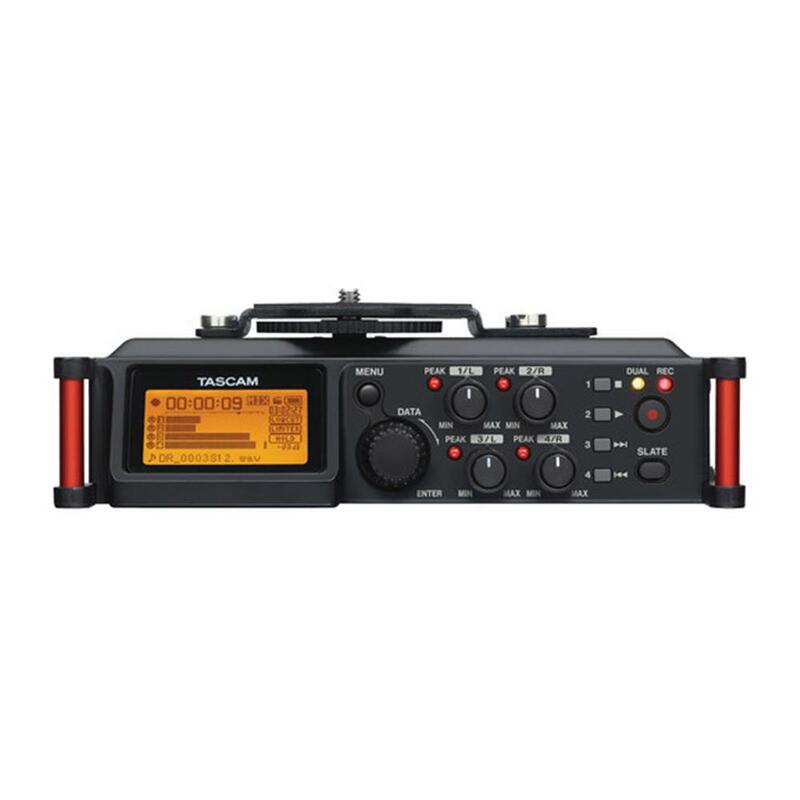 The DR-70D from TASCAM is the ultimate audio recording solution for filmmakers. Four balanced XLR mic inputs meet the requirements of production sound, from professional users to indie DSLR shooters. The compact format can be mounted either above or below a camera, and a pair of built-in microphones can capture sound on-set. The interface is designed for quick adjustment, with additional features to keep recording levels under control. Four XLR mic inputs with phantom power are included on the DR-70D, enough to cover busy scenes. The High-Quality HDDA (High Definition Discrete Architecture) Mic Preamps include 64dB of gain for quiet performances, and all four inputs have individual gain controls. Each input has a limiter and low cut filter available for controlling volume. Also included is Dual Recording mode, which records a safety copy of your audio at a lower level to prevent distorted takes. Quality components like 5532 op amps are used throughout for the clearest audio possible. Tracks on the DR-70D are captured to SD card, SDHC or SDXC media - up to 128GB cards are supported. The recorder has tripod mounts on the top and bottom of the unit, allowing it to be mounted on a camera, a follow-focus cage, or used standalone. Other production friendly features include a slate tone, low-noise buttons, a powerful headphone output, and standard AA battery power. Uniquely designed for the needs of filmmakers, television producers, advertisers, and documentarians, the DR-70D packs multitrack recording into a package compact enough to use with any camera. Two omnidirectional microphones allow easy recording of natural stereo sound without using external mics. Used in combination with one or two other mics, the DR-70D becomes a compact setup for recording interviews and ambient sound at the same time. 4 XLR/TRS inputs are built-into the DR-70D. The four-channel design enables combinations of shotgun microphones, lavaliere mics, and the built-in stereo mic to be recorded individually. Channels 1 and 2 can be set to stereo input and channels 3 and 4 can be set to the built-in mics, making a variety of mic configurations possible. MONO/DUAL MONO : Best for recording the audio of a single performer. STEREO/DUAL STEREO : Best for recording with the built-in microphones or a stereo mic. 2MIX/DUAL 2MIX : Creates stereo files of two or more mixed inputs. Dual Recording mode can be used to create a backup file that is simultaneously recorded at a different level to prevent clipping when levels exceed the maximum input. The second track is recorded up to 12dB lower as a safety track to prevent distortion ? if your input signal overloads, you have a backup that isn't distorted. Each fo the four inputs is sent to a stereo mixer. This allows each input to be recorded individually for post production while a stereo mix is sent to headphones and the camera guide track. In addition to being able to adjust pan parameter, each input includes a limiter, a low-cut filter, and a delay to adjust for distances between mics. In addition, a mid-side decoding function enables the use of a MS stereo mics. Microphone preamps do a lot of work to convert your mic-level signals to recordable levels, so they have a big impact on the quality of the audio that is recorded. 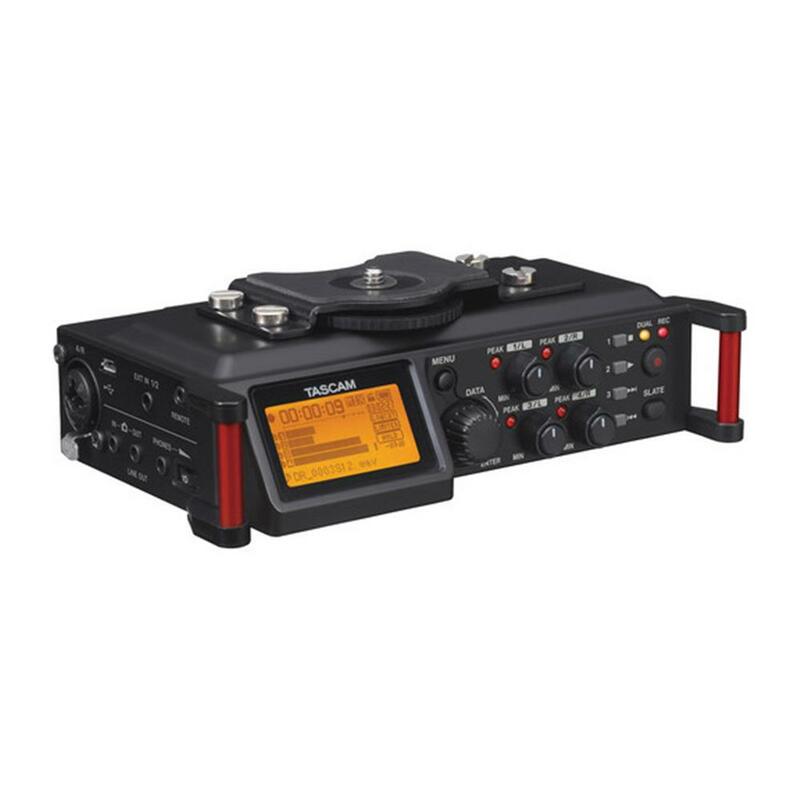 The DR-70D uses TASCAM HDDA microphone preamps - created through careful selection of parts. An NE5532 op-amp was selected for its outstanding effect on audio quality. 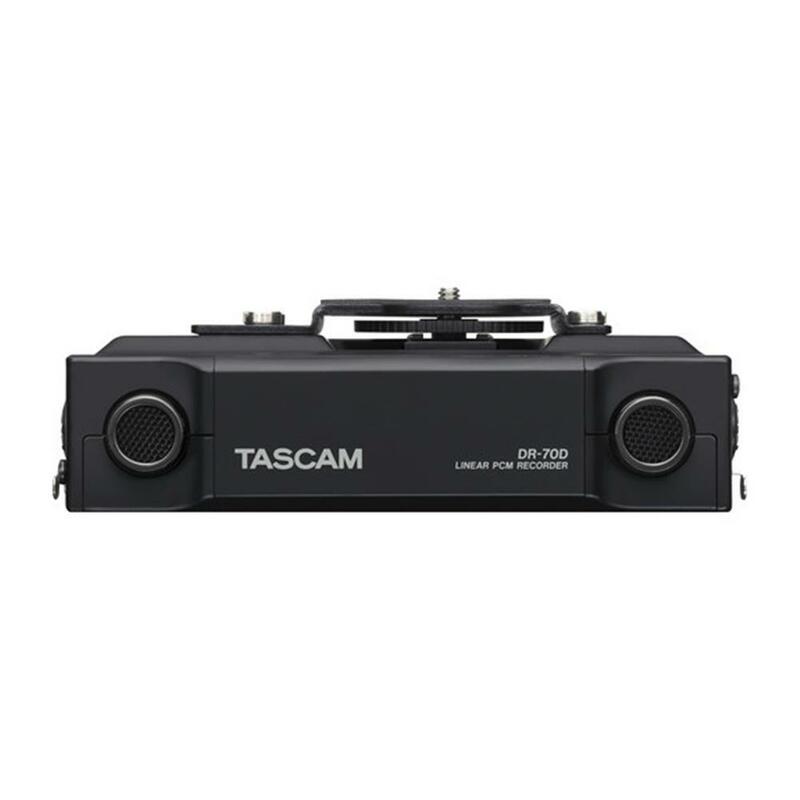 Through a mix of discrete architecture and hand-picked components, TASCAM has achieved an equivalent input noise level of &#8722;120 dBu. The A/D converter is made by CIRRUS LOGIC, similar to those used in the TASCAM DR series of linear PCM recorders. This high-quality converter - miles better than those included in DSLR cameras - ensures quiet, clean audio recording. Audio resolutions up to 96kHz/24-bit are supported. The DR-70Ds design is as compact as possible to stay out of the way while filming. The bottom of the unit has tripod screw threads for mounting under your camera or on a follow-focus cage. A removable camera attachment screw and hot shoe for the top of the unit are also included. The DR-70D can be attached in the way most convenient for the user by placing it between a tripod and the camera, or on top of the camera with a hot shoe mount. A stereo mix of your audio is sent to the camera output for later synchronization in your editing software. Simply drop your audio and video into the multi-camera feature of most editing software and audio will be automatically synced. Alternatively, software such as Red Giant Pluraleyes can be used to automatically sync audio and video. 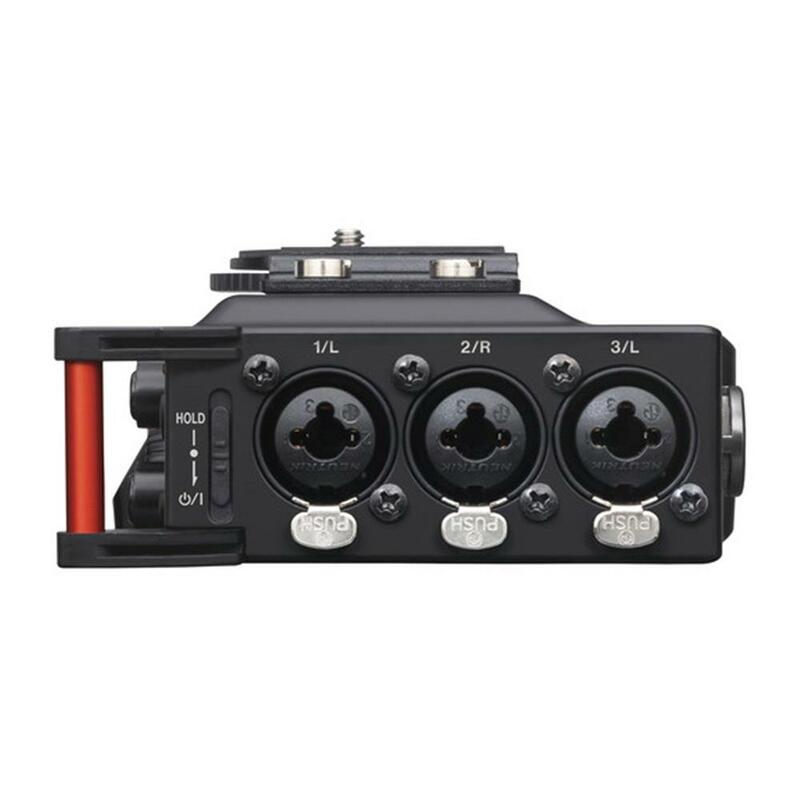 The camera output jack can be attenuated down to mic level to prevent overloading the audio input of DSLR cameras. The built-in generator can produce slate tones that can be used as references when aligning audio and video. Line up the waveforms when you need perfect sync between audio and video. In addition to being able to produce slate tones when recording starts or when it starts and stops, the SLATE button can be used to add slate tones at any desired point. Manual insertion: Press and hold the SLATE button to produce a slate tone. 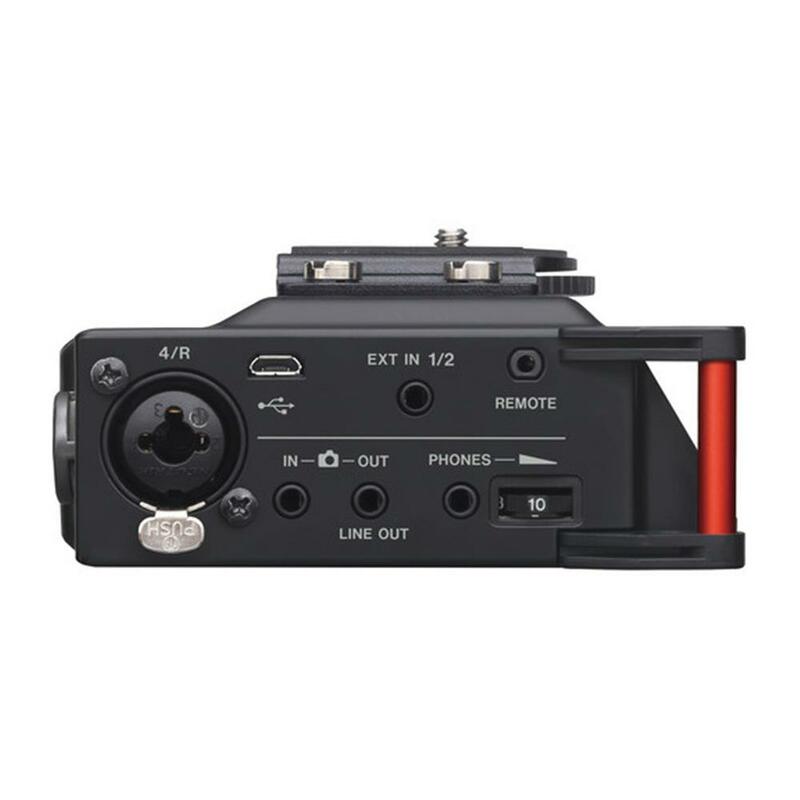 The 3.5mm stereo 1-2 input mini jack allows the connection of consumer video camera mics. For example, connect a video camera mic for ambiance to jack 1-2, and shotgun mics to the XLR 3-4 jacks. This unit can supply plug-in power to the microphone and has a maximum input level of +10 dBV. The Camera In jack allows playback from your camera to evaluate a take. Either the camer signal or DR-70D can be monitored through the headphones. Operates on (4) AA batteries, with an optional AC adapter (TASCAM PS-P515U) or USB cable provided with the unit (USB bus power). SDHC card (4GB to 32GB), SDXC card(48GB to 128GB) High speed cards required.